Some people in the UK ask me through this website about adopting a wildcat as a domestic cat. This is much rarer than in the USA, where it is relatively commonplace. But the concept of owning and living with a tamed wildcat is here in the UK and many people, I feel won't be aware of that. Photo copyright Kathrin StuckiAnyway to the point. 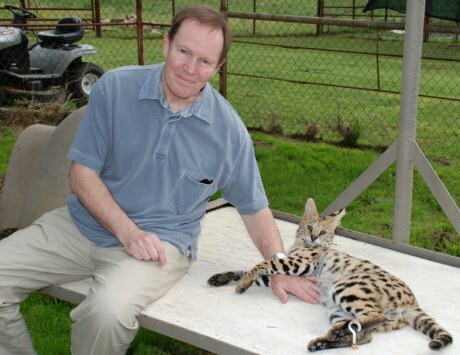 I have been informed by a breeder in Scotland, who made a short submission of which this is an expansion that (s)he has serval cubs for sale ready to leave their cattery in March 2010. The price is £8,000. The breeder is Wild Cat Breeder. It is fully licensed. They also breed Asian Leopard cats (these are the wild cat parents of the Bengal cat. 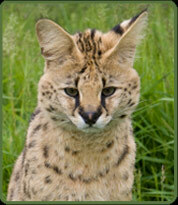 The serval is the wild cat parent of the Savannah cat. by: Anonymous This was a spam comment and has been deleted. by: Anonymous I'm in agreement with Gail on this one. Beautiful as they are, I don't understand why people would want to consider keeping a wild cat as a pet. There are already far too many people who don't know how to properly care for their domestic cats, never mind the specialist care and environment required for a wild one. I'd prefer people spent their money helping organisations preserve wild cats and their natural habitat than make them into designer pets. Alternatively, spend that money on getting the necessary qualifications or skills so they can work with those animals in the wild where they belong. by: Rudolph.a.Furtado Thanks Michael for educating bloggers of "P.C" on the prices of "Exotic wil pet cats". At 8000 Sterling cost( Ind Rs 6,40,000 approx) it reminds me of the "Maharajah and Nawab Era" of India, something i have read in history books. and these "Serval Kittens" are definitely "Rolls Royce luxury pets". Are there manny buyers for such costly pets?Remember, just paying 8000 sterling and purchasing a serval is easier than maintaing the pet over its entire lifespan, requiring specialised care and house habitat.Its the difference between owning a "Rolls Royce Car" and a normal commuting 4- wheeler. by: Gail (Boston, MA USA) Hi Michael, just curious but why would anyone want to adopt a wild cat? No disrespect intended, believe me - I just don't get it. What is the fascination? If anyone can explain it, I truly would like to understand. Thanks. And you know some of these poor cubs will be declawed by their new owners. This is wrong on so many levels. The servals are indeed beautiful, but they belong in the wild or in a facility that knows how to care for them properly. Not as a household pet. Hi more Michael, please can you help me identify the names of some kittens if I send you the video? Could you do a screenshot of a part of the video an upload the still image? Sure that’s fine. Email me the video if it is small enough or provide a link to the page where the video is.